Author(s): Senthamil R. Selvan, John P. Dowling, William K. Kelly, Jianqing Lin. Division of Solid Tumor, Department of Medical Oncology, Thomas Jefferson University, 1025 Walnut Street, Suite 700, Philadelphia, PA 19107, USA. Indoleamine 2,3-dioxygenase (IDO) is a heme-containing oxidoreductase that catalyzes the initial and rate-limiting step in the breakdown of non-dietary tryptophan. The biology and immunomodulatory role for IDO is discussed in this review with a focus on its interaction with immune cells and its potential therapeutic target in the clinic. IDO has been revealed to be a central regulator of immune responses in a broad variety of physiological and pathological settings, mostly serving as a multifaceted negative feedback mechanism, to self-regulate immune responses. IDO is considered a therapeutic target in cancer and the use of IDO inhibitors as single agent or in combination with other treatment modalities are under active investigation. Keywords: Cancer immunotherapy, combination therapy, indoleamine 2, 3-dioxygenase (IDO), IDO inhibitors, immune tolerance. Affiliation:Division of Solid Tumor, Department of Medical Oncology, Thomas Jefferson University, 1025 Walnut Street, Suite 700, Philadelphia, PA 19107, USA. 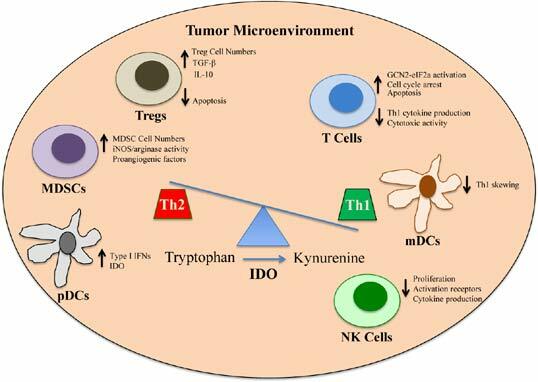 Keywords:Cancer immunotherapy, combination therapy, indoleamine 2, 3-dioxygenase (IDO), IDO inhibitors, immune tolerance. Abstract:Indoleamine 2,3-dioxygenase (IDO) is a heme-containing oxidoreductase that catalyzes the initial and rate-limiting step in the breakdown of non-dietary tryptophan. The biology and immunomodulatory role for IDO is discussed in this review with a focus on its interaction with immune cells and its potential therapeutic target in the clinic. IDO has been revealed to be a central regulator of immune responses in a broad variety of physiological and pathological settings, mostly serving as a multifaceted negative feedback mechanism, to self-regulate immune responses. IDO is considered a therapeutic target in cancer and the use of IDO inhibitors as single agent or in combination with other treatment modalities are under active investigation. The Anti-Cancer Charm of Flavonoids: A Cup-of-Tea Will Do!